This Game of Thrones glass tankard mug is perfect for a nice cold drink after battling through the day. The glass features the phrases “All Men Must Die” and “All Men Must Serve” with their High Valyrian translations “Valar Morghulis” and “Valar Dohaeris” below, all in gold metallic detailing. The heavy base and thick handle makes this a quality piece which is the perfect addition to any Game of Thrones display. 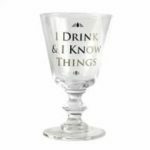 This Game of Thrones glass tankard mug is perfect for a nice cold drink after battling through the day. 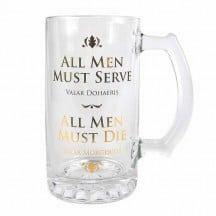 The glass features the phrases “All Men Must Die” and “All Men Must Serve”.With their High Valyrian translations “Valar Morghulis” and “Valar Dohaeris” below, all in gold metallic detailing. The heavy base and thick handle makes this a quality piece which is the perfect addition to any Game of Thrones display.